Nothing says “summer time” more than splashing around with friends in the pool and sunny days spent on the lake. And nothing is more fundamental to the IS summer camp experience than the fun and challenging Aquatics Program. Days spent in the heated pools, aqua playground, and waterfront activities, are central to camp life and loved by all. Being able to cool off in the pool or lake and enjoy time with friends on hot summer days, is the perfect way to build camp memories. The aquatic activities at camp are part of a comprehensive program giving campers outstanding American Cross swim instruction from certified instructors, while having a blast in the aqua-playground and challenging themselves at a variety of watersport. But the most important part of the aquatics at camp is the fun that campers have as they exercise, improve their swim skills and take on new challenges and become more confident. The pool and lake are the backdrop to many other activities that campers cherish, from early morning Polar Bear swims and evening pool parties, to color week activities on the lake and the beautiful lakefront setting for traditions like the “burning of the year” on the last night of camp. The extensive waterfront program at the lake allows campers to try things that they most likely don’t have the opportunity to do year-round. The aqua-playground is equipped with activities like our Giant Slide, Water Trampoline, Rope Swing, Jungle Gym, Rock it and more. The waterfront has canoeing, kayaking, paddleboards, tubing, wakeboarding, and waterskiing. Campers even have the chance to try out some fishing. 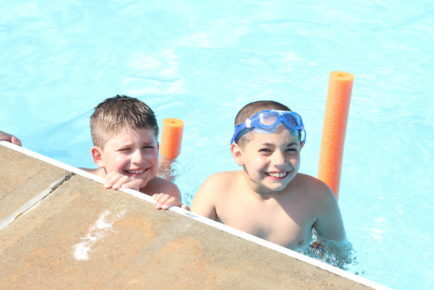 The 2 heated pools are not only a place for instructional swim, but daily free-swim, and many exciting activities such as intercamp swim meets and the Morry’s Camp swim-a-thon. Making all the fun, excitement, and safety possible at the pool and waterfront, are the certified and dedicated staff that give campers the attention and instruction necessary for a successful and memorable summer. The aquatics staff provide hands-on instruction and the encouragement and confidence campers need to step outside of their comfort zone and try everything this challenging program offers. The pool and waterfront staff are an exceptional group of people who know the importance of the lifetime skill of swimming, both the overall physical benefits and feeling of empowerment it can bring. Summer camp and aquatics go hand-in-hand, and we can’t wait for summer 2018 to start, so we can all enjoy the great IS water activities. Some of the best memories at camp are centered around the waterfront, where a camper learns to waterski for the first time or learns a new swim stroke. Get ready to cool off in the pool and lake, build new swim skills, take out a canoe or kayak, try out wakeboarding, and develop a whole new level of confidence.